A week on and Standing Stone Games have revised the latest test iteration of Update 22 for LOTRO, on the Bullroarer server. Build #2 now has a proper map that explains exactly where I went last Sunday. 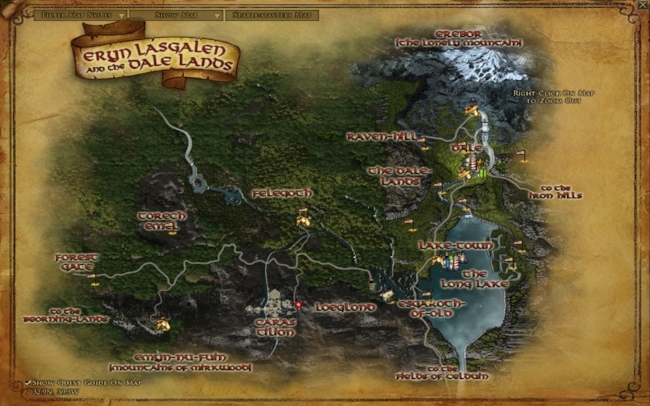 It seems that I visited all locations of note apart from Caras Tilion, a deserted Elven stronghold to the South of Eryn Lasgalen, at the foot of the Mountains of Mirkwood. So, I promptly went there tonight and found it inhabited by Fell Spirits and such like. I suspect that this will be the location for a group event as the mobs all seem high level. Like other areas in the test build, the terrain is unstable, and you can find yourself falling through what are supposed to be solid surfaces. Although there are roads marked on the map, trying to find them on the ground and follow them is somewhat harder. However, I suspect that this is meant to reflect the source text of The Hobbit in which the path through Mirkwood was often overgrown and difficult to track, hence the Dwarves got lost. I revisited Lake-town and found that there are now more NPCs and sundry embellishments. On the end of some of the piers, you will find locals queuing to use the privies, which I found rather amusing. The only other’s I’ve ever seen in LOTRO are in Rohan and are indirectly involved in a quest. It would also appear that I was broadly correct in my assumptions about the three entrances on the map and where they lead. The eastern door is now clearly marked opening to the Iron Hills and the Forest Gate to the west does lead to Beorning-land. The third entry (or exit point) to the South of Lake-town lead to an area called the Fields of Celduin. Celduin is the Elven name for the Running River, which flow ultimately to the sea of Sea of Rhûn. Perhap SSG have plans to develop Dorwinion as part of LOTRO. Dorwinion, was a land in the vales of the Celduin, northwest of the Sea of Rhûn. It was famous for its great gardens and as the home of the finest wines in all of Middle-earth. Its people were descendants of the Edain, and they had close ties to the Northmen of Dale in genealogy as well as Avari Elves. Again, I spent my time this evening simply investigating the immediate area in this latest test build and have not undertaken any of the quests in the region. I prefer to wait for the final release of the update, so as not to spoil my enjoyment of it all. My overall opinion of Eryn Lasgalen and the Dale-lands remains the same as I stated in my previous post. This is a well realised and quite striking zone and Lake-town is a stand out location. It certainly is a welcome relief after the dour and oppressive atmosphere of Mordor. I hope that the quests featured in update 22 are as equally creative as the area itself. It just remains to see when SSG intends to release this update. If past events have any bearing on the matter, we may well see a formal release of this area within a few weeks of three or four test builds. Therefore, we may have a live version of this new area by the middle of March.